Innovation is overrated. Entrepreneurs don't really matter. I know: blasphemy, blasphemy. But ... it's true. Most innovations fail - so do most entrepreneurs. The vast majority in fact. It gets worse: most (97.8%) of the gains from innovation accrue to others, not to the innovators. Which is why I think initiatives such as the Government's to build the Smart Economy are deeply flawed. The idea that the source of our future wealth and wellbeing lies in more Phds and more patents is utter nonsense. As Amar Bhidé pointed out in a recent interview, I am more likely to gain from innovations in China or India than I am from any in Ireland. The tools that I use in my work have been invented elsewhere - but so what? The value that I create with Dell computers manufactured in China and software designed in Seattle vastly outweighs the costs of those particular inputs. Nowadays, really valuable innovations are those with a high 'Innovation IQ' or Interoperability Quotient. In other words, it is the ability to make new connections between existing systems, platforms and networks that unlocks massive new business opportunities than any isolated inventions. Google could not have come into existed without the world wide web. Nor the iPhone without mobile phone networks. 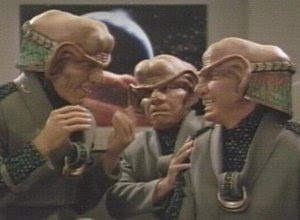 We Irish should become more like the Ferengi (who had 178 words for 'rain' we're told) - using innovations invented elsewhere to create new businesses and entire economic sectors. Though I'd like to think we'd, er, pay for them first. It is this insight that is at the heart of what Havas Media Lab's Umair Haque calls The Smart Growth Manifesto - with its focus on outcomes, people, connections and creativity. Bhidé says much the same thing: it is people who determine the 'innovativeness' of an innovation - not the inventors. I think most people intuit this nowadays. I recently ran a workshop in county Louth, looking at business opportunities arising from its age friendly county initiative. What was encouraging was the instinctive grasp of the need to "use what we've got, together" - rather than to be the first to ever do something or to invent some new technology or something. They are very much focused on their Innovation IQ: and I have no doubt will benefit accordingly. Likewise, initiatives such as the Irish Recovery resource are about forging connections and raising our collective Innovation IQ. Much smarter than fretting about R&D shares of GDP and other such distractions. You are so right, but there's one point that you didn't mention is entrepreneurs are probably the only ones who can jump start an economy, even if they are doomed to fail. It is the entrepreneur who puts everything on the line and spends every penny they can beg, borrow, or steal into the economy. They operate with reckless abandon, buying, spending, and hiring even though their lifestyle carries such high risk and ultimately fails. So, yes there will be a great price to pay in the dashed dreams ahead, but do we have a choice? You can see what happens when the money goes to corporations with recently emptied deep pockets. They just sit on it. And that shouldn't surprise anyone. You have blown the cover on another myth - "we need more PhDs". As someone of a mature age who went back to do a science-based masters in UCD 2 years ago I got a good insight into the inputs/outputs involved. Labs jammed packed with French and Italian students, marvelling at the conditions available to them. The first they did when qualify was to go home and boost their own 'knowledge economy'. Large numbers of non-EU students who the schools like because they pay 25k for the privilege and then head off home. Irish students working on marine institute, teagasc, EPA sponsored PhDs who seemlessly parachuted into jobs in these government agencies. It left me confused wondering where these 4th level individuals add productivity to the economy - let alone innovation and patents. These are genuine observations of someone seening the system up close. The Havas Lab is coming up with some interesting ideas - the issue Gerard is how these types of community initiatives can yield streams of income for people with some degree of predictability. There may be a small portion of humanity who are tech literate, educated and also resourceful enough to be completely comfortable with the idea of fitting in and making their living in a complex non-linear organisation with no formal billing structure. But the majority of people still like the idea of signing up for a wage with a contract and pension entitlements and all the rest of it. If a new economy is going to emerge from this collapse focused on collective innovation facilitated by online activity, people need to start asking more probing questions about how income would be distributed in such an economy and what insurance would be available to hedge people against periods of low income. The 'Fourth Level' imperative needs to be challenged. As The Graduate has said a review of current PhD funding in third level institutions would show that indeed most research grants in the science area are taken up by talented continental European students, who may not in the future contribute to our future growth. Seems to me that many of the Institutes of Technology in particular have been driven in their PdD strategy more by an unquestioning desire for status and university status than any clear view of where their 4th level programmes contribute to the 'Smart' economy. the issue of whether grants should be restricted to Irish students is one that is more complicated than is being suggested here. Opening up grants to EU applicants and indeed non-EU applicants fosters greater competition for them and improves the talent pool researching in Irish universities. Having talented people from abroad working in Irish institutions facilitates network building, generates positive peer effects and other benefits. However, this does cost the Irish taxpayer the scholarship and hosting fees and almost all rich countries make calculations as to what costs and benefits they obtain from funding international phd students so this is not a mad issue to raise. One thing that should be noted is that the cost is mitigated by the fact that if other countries reciprocate and make their grants available to Irish applicants it increases the funding opportunities abroad for Irish applicants. Thus if you do start making these cost-benefit calculations it is important to realise that Irish strategy isnt made in a vacuum and we should process the wider European benefits of having mobility and competition as we would do in any market. Also international PhD students and researchers arguably provide many external benefits to the cities they live in and dont impose any cost other than their scholarships. Indeed many countries such as New Zealand have taken Richard Florida's view that competing for these talented people may be the future of economic success and are now competing vigorously to attract PhD students in key areas. There are a lot of gaps in Florida's theory with respect to the evidence at present but, in general, I see sense in the view that Irish cities should be trying to be hubs for researchers and its worth factoring this into any discussion of the pros and cons of international graduate student funding. In my view, the problem with PhD's from a wider economic perspective at the moment is that there is low matching between PhD study and post-phd employment across Europe. Put simply, the jobs for people with these types of skills have not yet been created to a requisite scale or else the skills themselves do not match the demand. This is a more important issue for Ireland at present than the issue of nationality of the PhD students. The idea of an economy where people with PhD level research skills drive high-value start-ups is not mad but until we start seeing real matching occuring whereby Phd and postdoc researchers "spin-out" their ideas into the wider world or make good livings working in the labs of people doing then people are right to raise questions. I agree with Gerard that these dont neccesarily have to be truly original ideas and that one role for bright and motivated PhD-trained researchers may be to sythensise ideas and apply them in real world contexts.